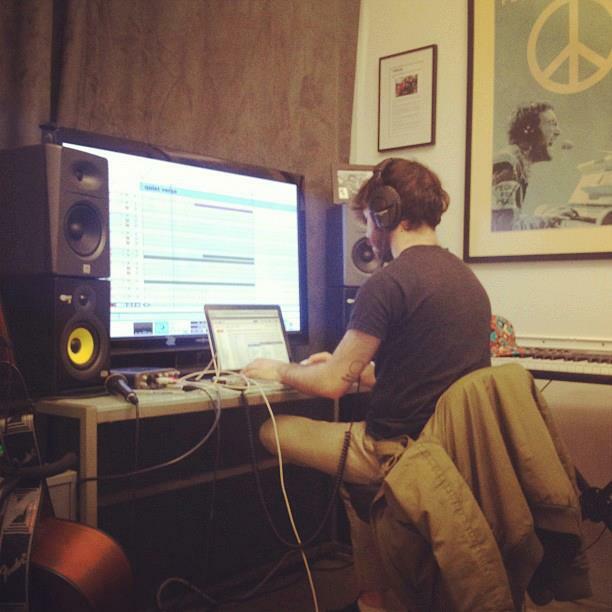 Producing a Pop Song for Preppers. One of my goals for this blog is to find interesting projects or creative experiences that are unlike things I’ve worked on before – or projects that give some new and interesting takeaways. This post covers something new that I had very little experience with – the creative process behind writing an original pop song. Returning for its 4th season on the National Geographic Channel, “Doomsday Preppers” is one of the more unique offerings in Non-Fiction television. It’s a show that is all about people who are preparing for the end of the world. They each have a different version of how The End will come – a nuclear war, or cyber attacks, the collapse of the economy, F-5 tornadoes, and so forth. This is the third season that we were putting a major marketing push behind it, with paid off-channel media to support it. The previous season’s poster art. Design and execution by Canyon Design Group. The curious thing about “Doomsday Preppers” is that at first glance, these people may seem a little nutty. They’re building bunkers with huge supplies of food, and concocting elaborate escape plans and defenses. But the more you watch it, the more you start to think “well, maybe it WOULD be a good idea to have some extra food on hand…” and the next thing you know, you’re buying a generator, packing a bug-out bag and stockpiling water. It’s a very relatable show, because everyone has stockpiled food and supplies before a big winter storm – but what makes “Doomsday Preppers” unique is that these Preppers all take their preparations way beyond water and food stockpiling – some of them have decoy food supplies, escape tunnels, and yes, even backup wives should things really go bad. The extreme nature of their Preps is fascinating – it’s ultimately great people-watching, and at the same time you get some pretty helpful tips…should the Government ever decide to, say, launch a nuclear strike against its own people and declare martial law for all of its citizens (a topic from this season). We’ve always tried to ride the line between making it entertaining, and relatable, and also informative – a huge number of the viewers are Preppers themselves and they enjoy seeing these new Preps. So entering this new season, everyone was eager to re-charge the franchise and find a new way to promote this show. 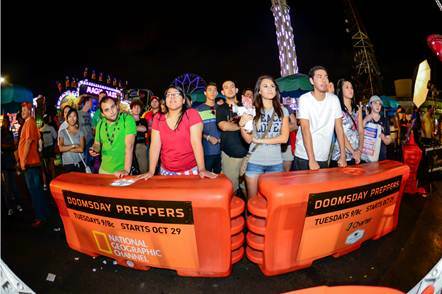 Eager fans at the Texas State Fair wait their turn for the “Doomsday Dash” obstacle course, part of the experiential/guerrilla campaign. 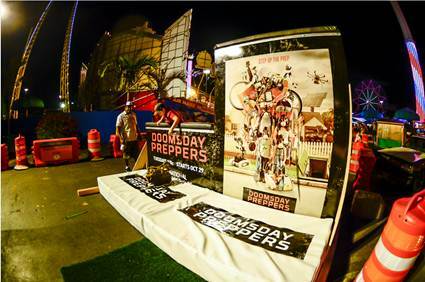 Key art used at the Doomsday Dash event at the Texas State Fair. This is season 4, and there was a real possibility of viewer fatigue – the 2012 Mayan Apocalypse is behind us, and perhaps the end of days was no longer in the zeitgeist. The ratings had begun to dip a bit at the end of the last season so the goal was to find new ways to talk about Preppers. They’re just as relatable as ever, but was the topic played out? And then there’s the age-old question for any returning franchise – how can the creative feel new? After all, the story hasn’t changed much…or had it? Well – it had changed in one aspect. It was no longer enough to focus on bunkers and gas masks – the show was tackling bigger builds, more ambitious Preps, and more dynamic Preppers than ever before. The stakes were being raised. We worked with a pretty big variety of partners on this project, and much of the creative concepting and campaign development was driven by our internal team, led by Creative Director Tyler Korba, Creative Director of Design Brian Everett, Senior Producer Nicole Strong, Design Director Carla Daeninckx and Sr. Creative Editor Brannon Shiflett. Early on, they worked together searching for what a good selling idea could be. We tapped some collaborative partners that had unique and specialized skills for different aspects of the campaign - Anatomy Media for the editorial for the promos, Arsonal Design for the print/digital, Adam Gault for design and graphics for TV, and Jingle Punks for a music concept – the part of the campaign that this post will focus a bit more on. 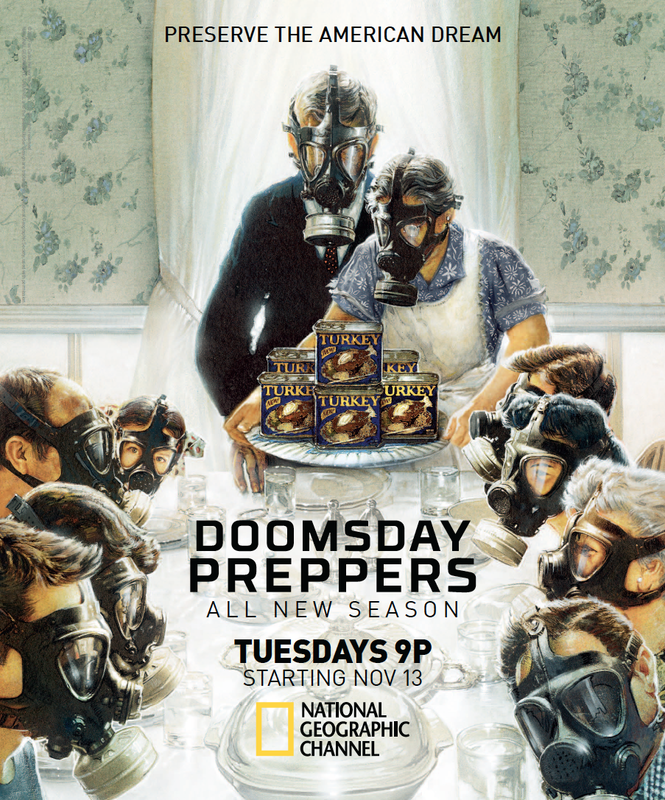 ‘Step up the prep’ graphic from Doomsday Preppers promo. Design by Adam Gault. Ultimately, the idea that this season was going to be bigger and more extreme – while still feeling connected to the core idea of Prepping – rose to the top. Nicole conceived the line “Step Up the Prep” as the tagline and rallying cry/theme for the campaign, which was extraordinarily helpful when evaluating every aspect of the campaign. If it felt like a “Step Up” from previous seasons, then we knew we were in the right zone creatively. There were a lot of ideas for TV, including a comedy concept that would have required a massive original shoot with Preppers and the outlandish lengths they went to prepare for The End (in the end, it was decided to just use the show footage rather than do any original shooting). And as in previous seasons, there was going to be a fun :45 music video to capture the intensity and entertainment that the show provided. In season 1 we licensed “The End of the World as we Know it” by REM, and in season 2, Fleetwood Mac’s “Don’t stop thinking about tomorrow.” And for our key art, there were some strong precedents that’d been set, having parodied the iconic “American Gothic” painting in season 1 and and the famous Norman Rockwell “Freedom From Want” painting in season 2 to great success. So we set out to build the campaign with a strong concept and some pretty high expectations. Season 3 horizontal key art, design and execution by Arsonal. TAKEAWAY #1: DON’T THROW OUT THE BLUEPRINT – JUST STEP IT UP. We set out from the beginning to build off of what we’d done in previous seasons creatively – but find new ways to freshen it up a bit. Some of what had been done before had worked, so we set out to find new ways to update the blueprint a bit. The most exciting and noteworthy ‘Step Up’ was the plan for the :45 music video. We’d always licensed a track before, but after last year it was clear that there are a lot of songs that would SEEM to fit the show (Destiny’s Child “Survivor” had been one consideration last season) they don’t always work with the content perfectly. And after season 1′s “End of the World As We Know it” video, it seemed like the very best possible song had been used, so rather than do an extensive music search that may not result in something fresh or “stepped up” – the idea came up to create our own theme song. Cue Jingle Punks, a music agency that we’d wanted to work with before that is known for writing original tracks and recording with emerging artists to create real, legit songs, not just promo music. Their work with Lynyrd Skynyrd for a “Pawn Stars” campaign was a good example of elevating the music beyond just a catchy jingle into a robust event idea. Just the idea of writing our own pop song that could speak to the new season’s stories felt like a “stepped up” creative idea that really would evolve the campaign. 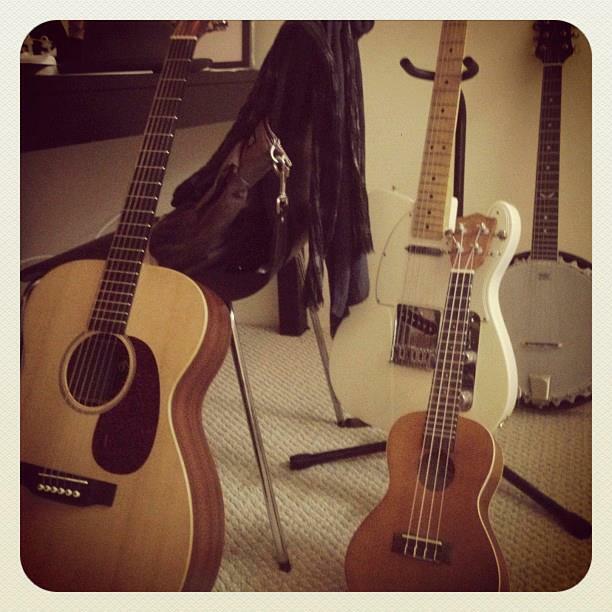 Jingle Punks’ Jared Gutstadt’s axes in LA, reporting for duty. Photo by Jared Gutstadt. And music perhaps more than any other medium is the perfect example of the Copy/Transform/Combine concept, as Kirby Ferguson’s “Everything is a remix” video series captures so perfectly. 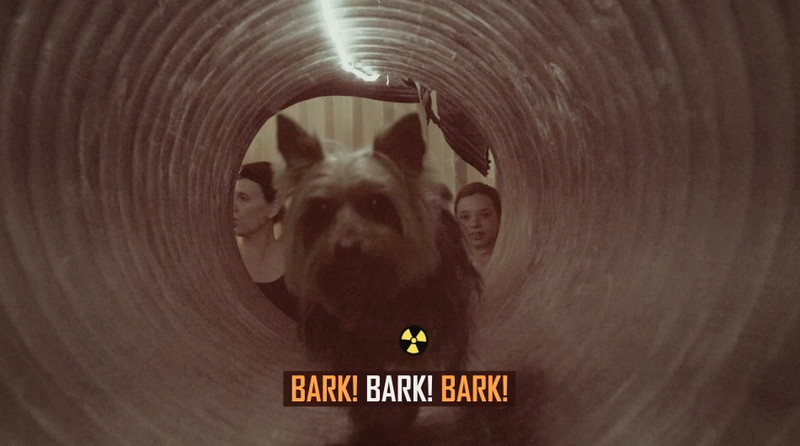 In the case of Doomsday Preppers, we looked to other songs for inspiration – then transformed them and combined them with elements from the show’s new episodes. JP wrote two new sketches based on this new direction, along with a first pass of lyrics and we were underway. Jeff Peters writes in the main Jingle Punks New York studio. Photo by Conrad Doucette. TAKEAWAY #3: GIVING MUSIC FEEDBACK IS HARD. I say this all the time – giving creative feedback on music is one of the hardest parts of my job. We do original compositions fairly frequently, (none with the ambition/scale of this song) and I always struggle a bit because music seems so much more subjective, and saying “well, I just didn’t like it” feels like the least helpful direction ever. In some of the early cuts, the song just didn’t feel right yet – the hook needed work, and parts of the song needed to feel more fun. Jingle Punks was extremely responsive and would quickly turn around new options, and since we were going to be recording with the artist as the last step, we had time to play. So despite our “hmm, can we make it better?” type of classic-client feedback, JP did an awesome job of tweaking and fine tuning the track until we were totally happy. The takeaway here is that it’s always going to be difficult to give music feedback – and you sometimes have to just go with your gut, and your subjective opinion. But perhaps the most important part is choosing a partner to work with that can either interpret your vague client-speak very well (as long as the client has an idea of what they DO want), or will keep pushing forward with new options until you both find something that works. JP did both of those very well, and that attitude was essential for the project’s success in the end. 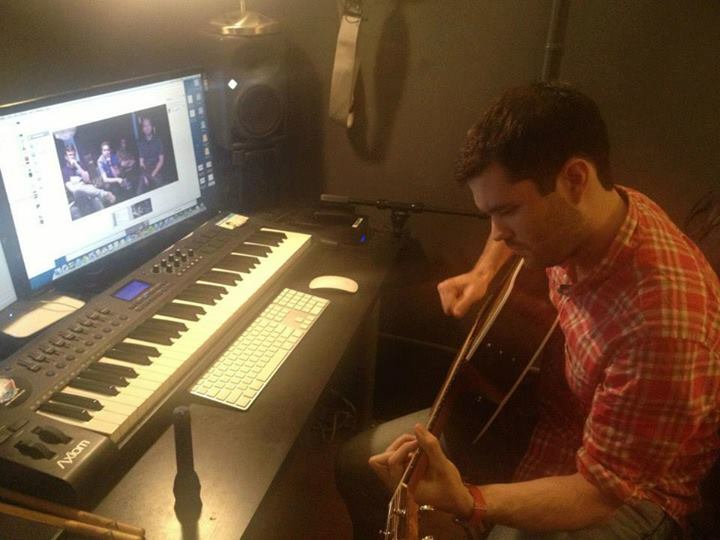 Luke Silas checks in with other composers while working in one of Jingle Punks’ New York studio rooms. Photo by Conrad Doucette. TAKEAWAY #4: WRITING LYRICS IS FUN, BUT COLLABORATING ON THEM IS BETTER. Screengrab from music video. Lyrics by Prepper dog. Final vertical key art by Arsonal Design. The final track was completed, and I couldn’t have been happier with the result. The song felt ‘legit’, and the lyrics connected perfectly with the new season’s storylines. And the final artist who recorded it added that “real” quality to it, giving some new accents and grit to the vocals and lyrics. Anatomy cut a :45 version for our air, and Nat Geo Sr. Creative Editor Brannon Shiflett cut a longer 1:45 music video that was used for some long lead press, online, and social media sharing. Carla and Adam tweaked the graphics and color correct to match the campaign look we’d established, and added in the ‘bouncing ball’ lyric lines to make sure that the lyrics we’d worked so hard on were clear! One of our concerns was that people would not listen close enough and might miss that it was a custom song – perhaps it was overkill, but the design execution was so fun, it seemed like a good move to make. Our internal marketing team jumped on board with the song, putting it on a “Doomsday” Spotify playlist as well as making it available for download. 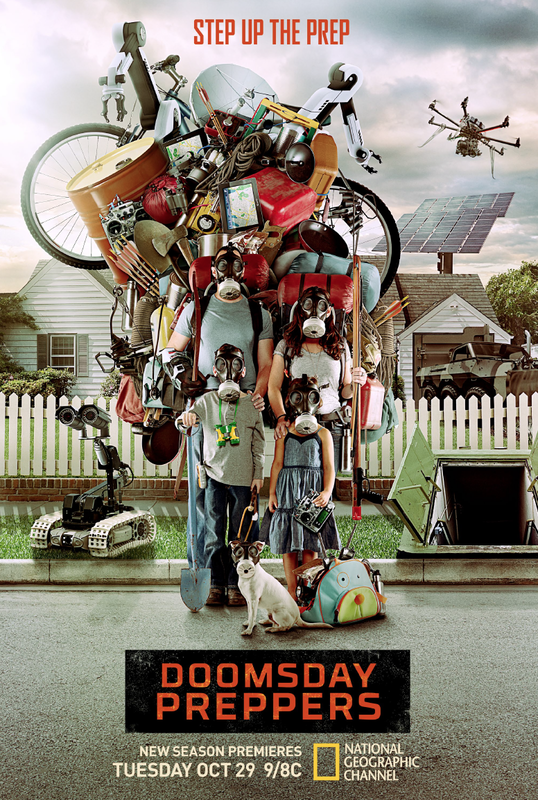 Combined with a robust TV campaign, we also created a piece of key art that also lived up to the “Step Up The Prep” theme, showcasing a family’s over-the-top preps, which was featured in an extensive digital campaign. I love the final creative on this campaign – trying to keep the marketing fresh and different on a returning series can be a challenge but everyone truly stepped it up, and a big thanks to Jingle Punks, Anatomy Media, Adam Gault, Arsonal, Brannon Shiflett, and Nicole, Carla, Tyler & Brian from the Nat Geo Creative Team . Thank you! 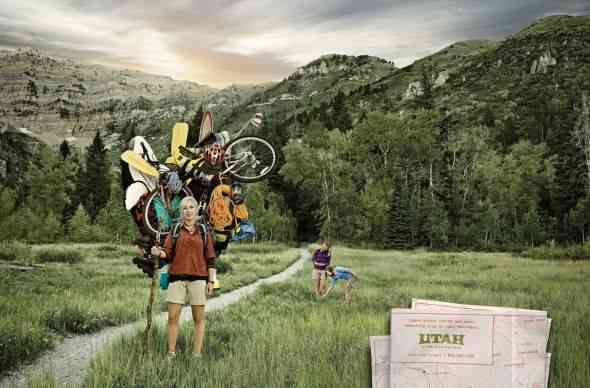 Great to see your creativity transcend print / video and into a brand new medium.